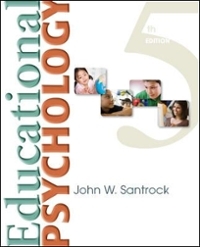 Educational Psychology 5 Edition John Santrock’s Educational Psychology emphasizes the application of theory to real classroom practice. With richly evocative classroom vignettes from practicing teachers and a wealth of case studies, Educational Psychology helps students think critically about the research basis for best practices. Santrock’s hallmark Learning System organizes the content into manageable chunks under learning goals, supporting retention and mastery, so that students will have an engaging and successful course experience.